dance.net - Brand New Childs Dress Cranberry Outfit. (10247895) - Read article: Ballet, Jazz, Modern, Hip Hop, Tap, Irish, Disco, Twirling, Cheer: Photos, Chat, Games, Jobs, Events! Brand New Childs Dress Cranberry Outfit. 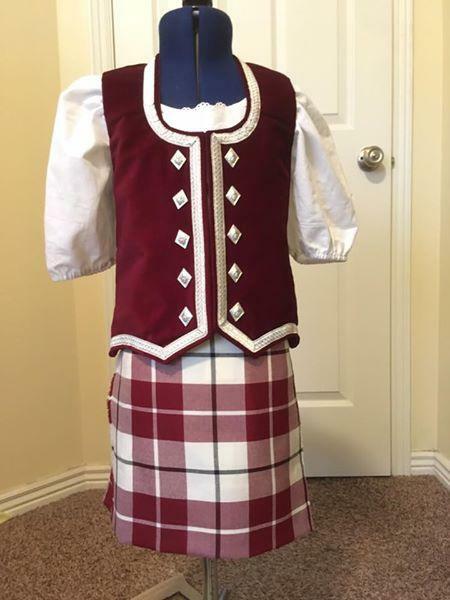 This new outfit includes a blouse, vest and kilt. Asking $300 USD plus postage. Chest 24", waist 22", hip 23", length 14. Kilt has a small growth pleat and a 3" hem. Cross posted. Can be altered before I ship it to you to better customize the fit. Asking $300 USD plus shipping. Easy Paypal or Venmo payment.